We congratulate the winners of the 2019 IACA Excellence in Currency Awards! The IACA Board gave the 2019 Lifetime Achievement Award to Anton Bleikolm and Lydia Yip. IACA Congratulates all of the 2019 Excellence in Currency Awards Finalists at Dubai Currency Conference. Lic.Barbara Eldbeissy Acting Ambassadar of the Embassy of the Oriental Republic of Uruguay collected the Finalist award on Behalf of the Central Bank of Uruguay for the Best New Commemorative or Limited Circulation Banknote. 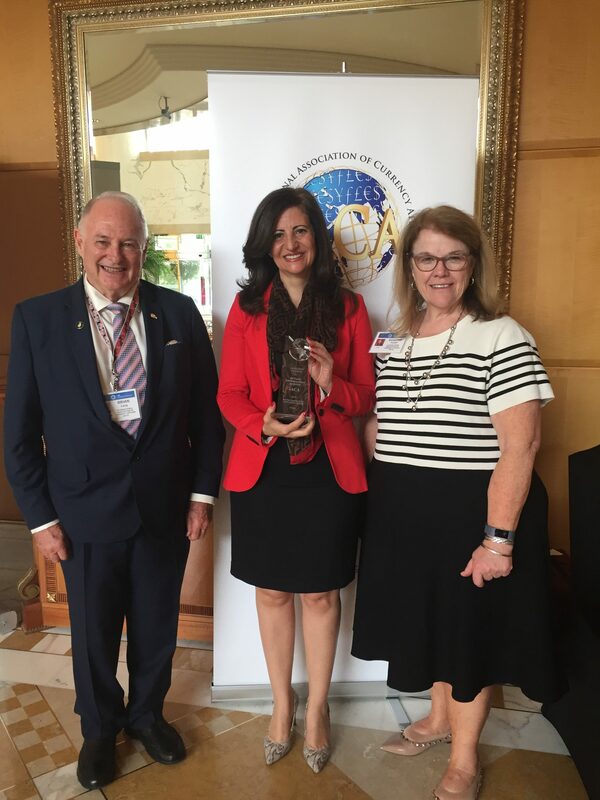 Brian Lang ( Vice President of IACA) and Eugenie Foster ( Executive Director of IACA) presented Lic Barbara Eldbeissy with the award.